We are now graciously making a Christmas countdown and i have already made an arrangement with my relative to please buy the Leap frog Leap Pad Learning Tablet, this item has been on my wish list for months already and im dying to have it as a gift for B.
Yup! 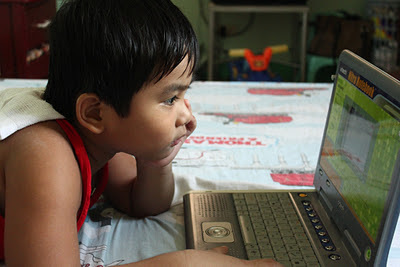 i was saved on buying that laptop and instead got this Vtech Nitro Notebook that my nephew lend to us. Mother says that nephew already lost interest using it coz he already capable answering those 80 activities and he's not challenge anymore getting a perfect score for every game and activity he choose to play. My B's using this notebook for quite a while, and he begins to master the activities on shapes, social studies, word challenge and fun games. Educational toys are really worth the price!